Here is the latest – if you are following Emily’s story. Before last week, Emily had completed all 4 combo treatments and 5 methotrexate treatments. The combo drug of doxorubicin and cisplatin were the worst weeks of chemo. Methotrexate is most difficult for the first 36 hours and then over about five more days, she feels back to normal. I read that methotrexate is sometimes prescribed for rheumatoid arthritis. That seemed strange to me because of what it does to Emily’s body, but there are people who take this drug all the time for arthritis. So I asked one of the oncologists about that. He told me that yes, metho is prescribed commonly for rheumatoid arthritis. The difference is they give Emily 10,000 times the amount of metho during a round of chemo compared to what is in a pill for rheumatoid arthritis, and it is toxic – so it must be flushed out of her immediately. That makes a little more sense why she has to be inpatient for the treatment. Going into last week – Emily has 2 doxorubicin treatments and 7 more methotrexate treatments remaining. 9:00 – Leave the house to drive to MD Anderson. Just Sue and Emily went down. I was traveling and wouldn’t get back until Thursday. 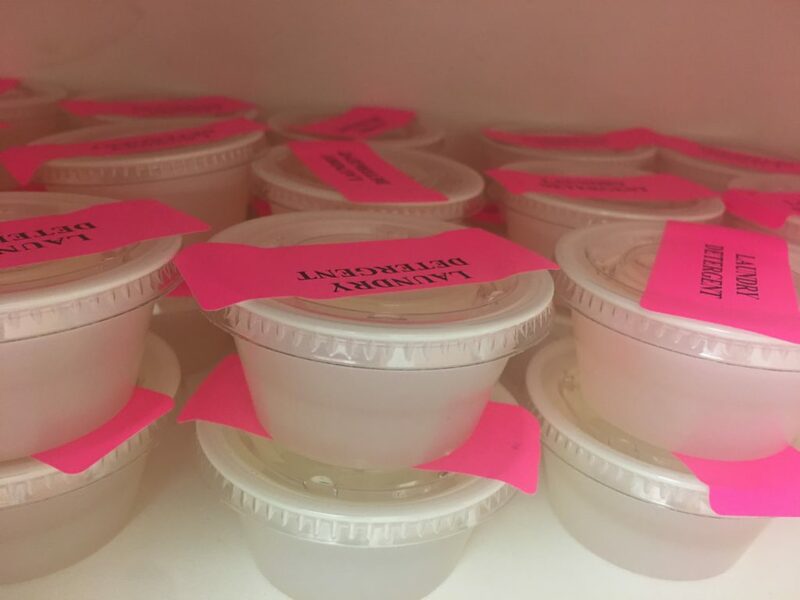 10:00 – labs to test her blood and be sure her counts are strong enough to receive chemo. 11:00 – Knee X-rays to see how the knee is holding up with the equipment in her leg/knee. 11:30 – Saw surgery (Dr. Lewis) – knee looks good. They told her she no longer needed to wear the brace! Things are progressing. She uses crutches as her knee isn’t strong enough yet to bear all her weight. 7:30 – Checked in to room 937 – they began 8 hours of running fluids. They think it may help clear the metho faster. 10:45 – The metho takes about 4-5 hours to get into her body. It didn’t finish until 10:45 AM. This chemo makes Emily feel sick immediately and she felt sick all day. They keep her medicated on anti-nausea meds and so other than getting up to pee, she sleeps all day when she can. This is a day where the room stays dark, and we sit in here quietly to be here whenever she needs us. I came in the afternoon straight from the airport and hung out until about 10:00 PM. Nurses come in every hour to two hours it seems to check meds, run tests, measure how much she has peed. 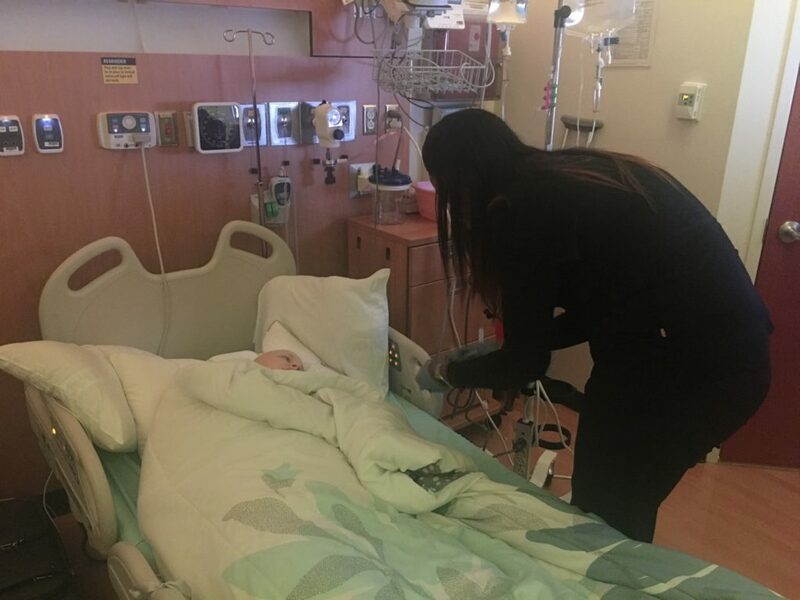 It seems endless and it is the reason Emly doesn’t get a full night’s sleep in the hospital – even when she is feeling well. They wake her up every night in the middle of the night to weigh her – so they can see how much liquid she has in her system. 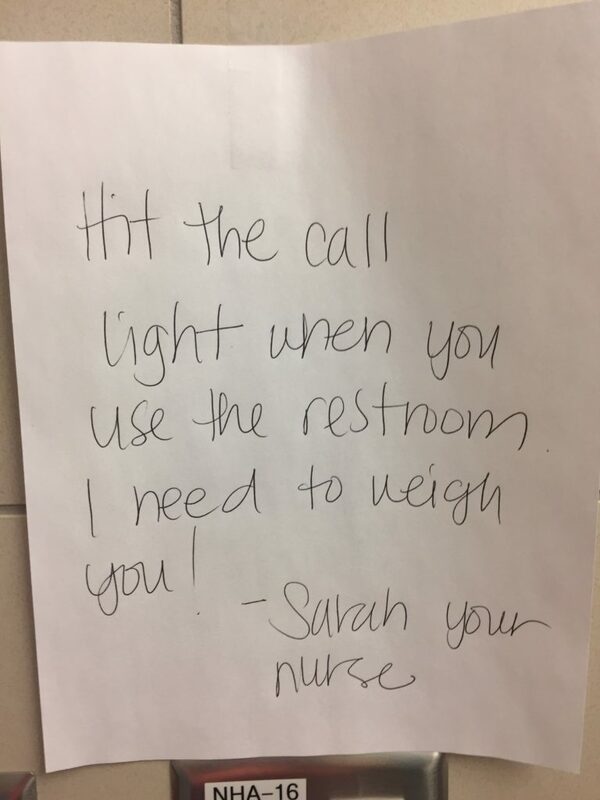 Apparently they do this in th emiddle of the night because doctors want a recently weight when they do rounds in the morning. This last week she had gained 9 pounds during a treatment. Eventually, she pees it out, but they run so many fluids into her that she bloats up during a treatment. She woke up feeling better! The first 36 hours are the most difficult, but she is through that. She will now take four or five days until she feels back to 100%. But today is vastly better than yesterday. Her 24-hour metho numbers was 8.66. It has to get to .1 before they will let her go home. And 8.66 is the lowest it has ever been after 24 hours. So perhaps the 8 hours of hydration made a difference! She ate some today but doesn’t want to drink anything. Things just don’t taste right to her right now. Chemo messes with your taste buds. I had to go to work until early afternoon, but hung out at the hospital in the afternoon and evening. Around 10:00 at night, I head to a co-worker’s home about 2 miles away. They have a room above their garage. It is so nice. I never have to bother the family since it is a detached garage, but it gives me quick access to the hospital. Her 48-hour methotrexate # is .39! That is better than it has ever been after 48 hours. We walked to McDonalds at the hospital next to MD Anderson. Emily didn’t use a wheelchair but crutched it all the way. That is a good sign and exercise helps get the metho out. Emily started feeling a bit sick in the late afternoon and early evening. Her blood pressure was high and the fluids were not exiting her body nearly as quickly as entering them. They gave her something for her blood pressure and to force fluids out of her system. Today, I left for St. Louis. I have a two-day consultation at a church. Her 72-hour methotrexate # was .11! It needs to be at .1 to go home, but we’ve never been this low this early. The on-call oncologist told her she could go home if she would drink 2.5 liters of water today and come back Monday to check her level. That sounded great to Emily. 5:00 – They discharged her and let her go home. This was so encouraging. She’s never stayed only four nights in the hospital for a methotrexate treatment. We were praying for a Monday release, but God went beyond and she was released on Sunday night. They tested her and her metho # was .07! So that was great news. She will go home for two days and come back Wednesday to start another round. Emily and Sue came on Wednesday for chemo week #11 (out of 18). It was pretty much the same routine as the week before. After 24 hours – her metho number was 9.1 (compared to 8.66 the previous week). On Saturday, Abby (who is living with us for the summer from Rochester) and Morgan went to the hospital to visit Emily. The on-call oncologist came into the room and told Sue and Emily that providers in the clinic fight over having Emily as their patient because they enjoy her so much (that’s the best Father’s Day gift I could have). I was home on Saturday for a few hours since I hadn’t been home in about 10 days. I unpacked, did laundry, and repacked to head to the hospital. After 72 hours – her metho number is .11 (same as last week). So we asked the doctor and they will let her go home tonight even if the number isn’t at .1!! Emily’s hemoglobin numbers are low – so they are giving her a 3-hour blood transfusion now. They will test her again for her metho number, then around 6:00 or 7:00 – we will head home! This is two treatments in a row that she will only be here 5 days and 4 nights. We are SO thankful. 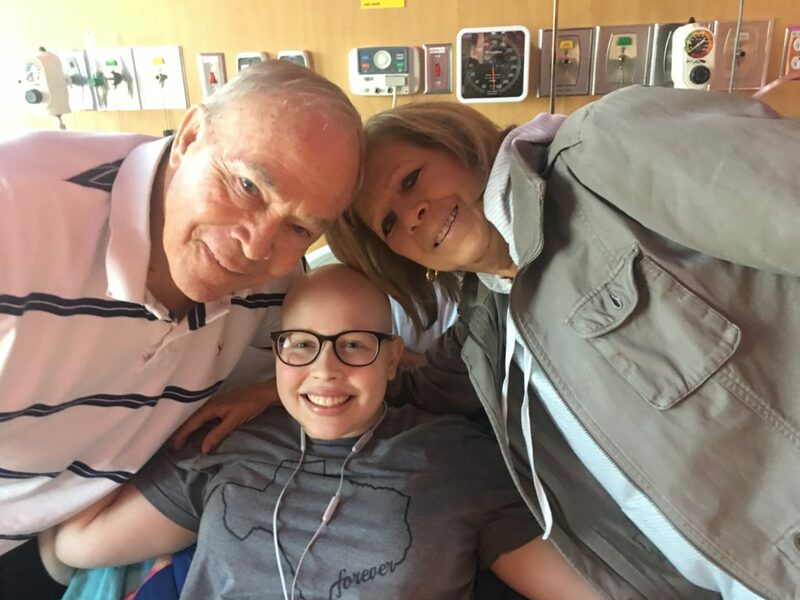 The oncologist has given her permission to postpone her next treatment until Monday, June 25 so Emily can go on the Christian retreat for young adults with cancer. She will be flying to California with her friend, Brooke, who has brain cancer. You can check it out here: https://www.stillwaterscancerretreat.org/. As of today, Emily will have finished 11 of 18 treatments. 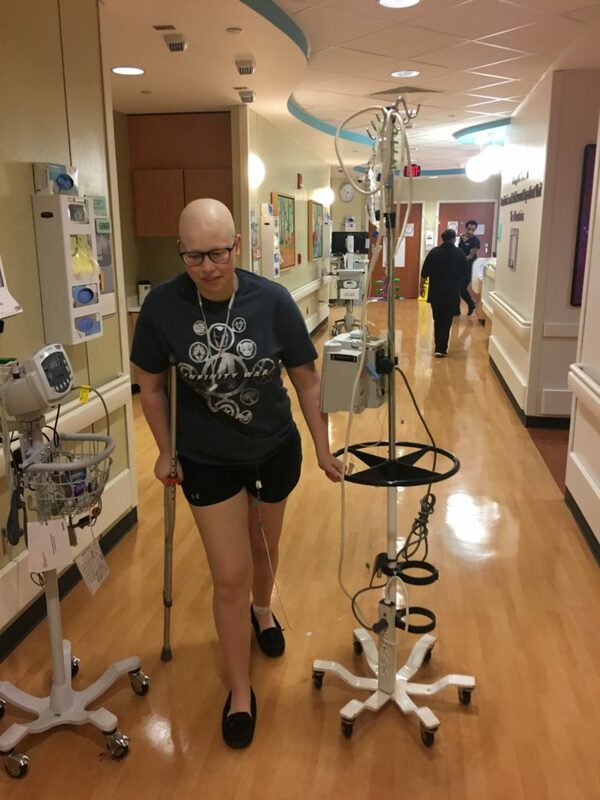 She has seven more to go – 2 doxorubicin treatments and 5 methotrexate treatments. We feel like we are starting to see light at the end of the tunnel. We are so thankful that two weeks in a row, chemo has been five days and four nights. That is such a blessing. It gave Emily three nights and two full days at home before coming back for another treatment. That lifts her spirits. I’m so thankful for Emily’s joyful outlook. When she isn’t in tremendous suffering, she always has a smile on her face and a cheerful disposition. That is a blessing for us as parents. Nurses who used to work with Emily but now work in a different part of the hospital often stop and see her. That is so encouraging to her and to us. We are thankful that Abby Holmsten will be with us for the summer. She’s doing an internship where I work (Vanderbloemen Search Group). So it is an extra blessing for our entire family to have her around. Emily has not thrown up during these last two treatments! It seems she has found the right combo of meds to at least keep her from throwing up during methotrexate. We are thankful for that since throwing up is one of her least favorite things. Pray that Emily’s body will be strong enough to travel to California on June 22. Pray that the retreat will be encouraging, refreshing, and challenging spiritually for Emily. She’s really looking forward to it. Pray that Emily can restart college this fall. I love that verse. I pray that Emily will see the Lord like she never has before and through it – she will see that He has been seeing and paying attention to her this entire time. 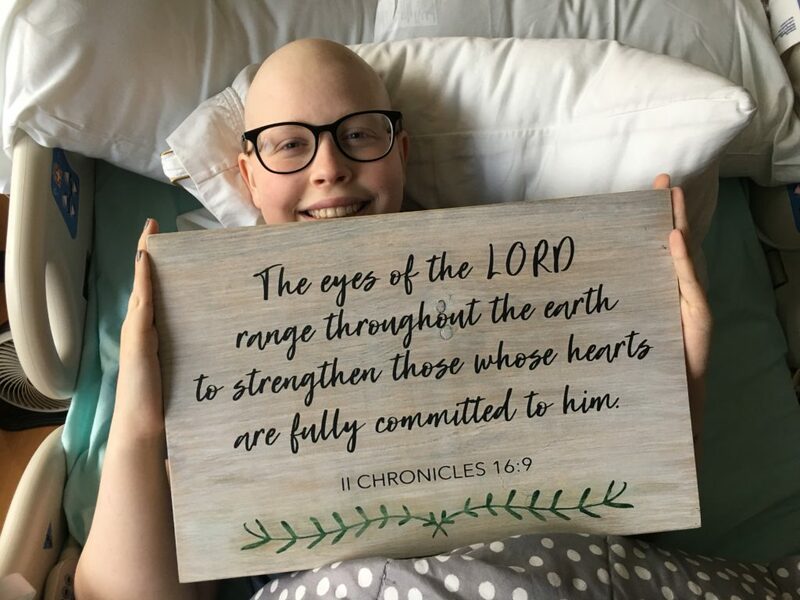 Finally, you will notice the picture of the wood frame we gave Emily for this round of chemo (the last photo below). This was the first verse I remember having our daughters memorize together. It is the most amazing promise. Pray that all of our family will be devoted to him – that is whom God is seeking. This is what it looks like during her first 36 hours. A dark room (pitch black unless a nurse comes in). These are long, silent hours where prayer and emotion come very naturally to me. This is Emily after the 36-hour sickness window. She is feeling better and is often entertained by various staff. 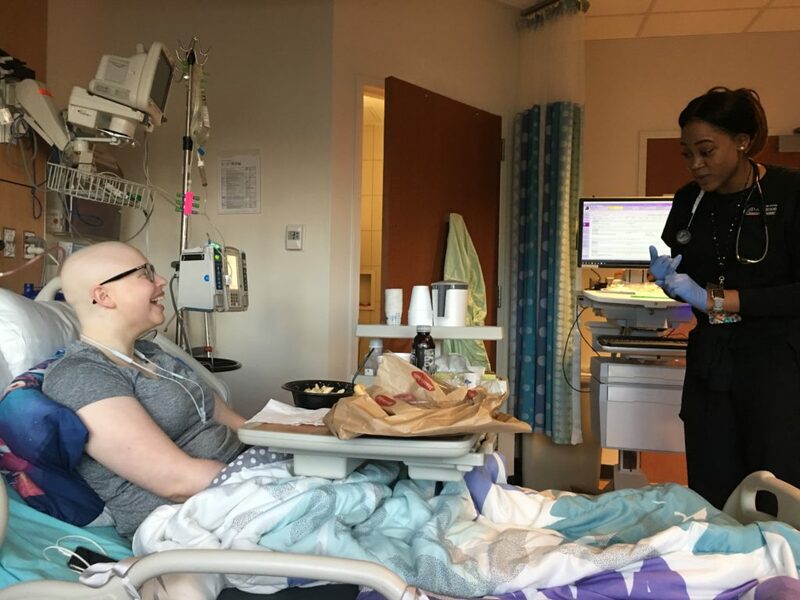 Sarah, one of her nurses, is asking Emly to explain aspects of the Marvel universe (one of Emily’s specialties). Sue’s parents have been staying with us for over a month. They ventured down on Friday and spent time with Emily. 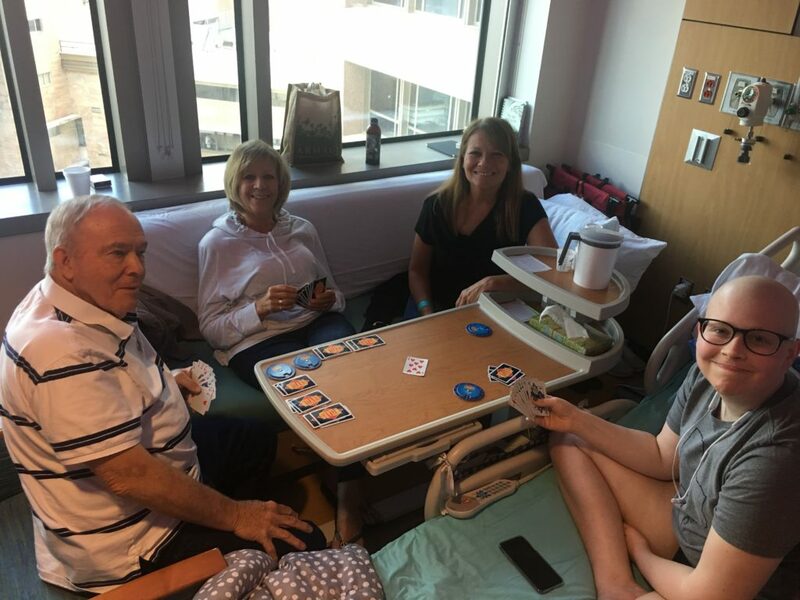 Emily’s favorite thing with grandpa is to beat him in Wizard – a card game. She had success again today. A goodbye to grandma and grandpa who flew back to Pennslyvania on Saturday. We are thankful for their support and help while here the last five weeks. They had a Father’s day breakfast available at the hospital. So Emily and I walked down the hall to enjoy breakfast together. 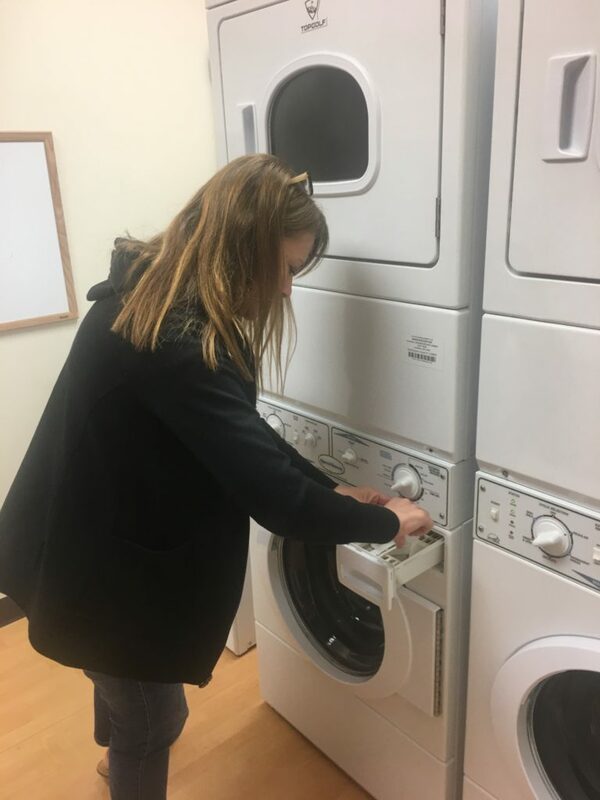 We are thankful the hospital provides free laundry machines. They even provide laundry soap! Another sign made by our friends, Hollie and Kaitlin (https://m.facebook.com/solittletimedesignco). I love the promise of this verse! Thankful for an encouraging report. So glad she can attend the retreat. Continuing to pray!! Great that you can enjoy Abby! Praise God for Emily’s fabulous numbers! Praise God there’s light at the end of the treatment tunnel and the combo treatments are OVER! It’s awesome she’s a favorite of the doctors and nurses, and she has so many opportunities to be a witness for Christ. I had no idea Emily loved Marvel. I must drop her a line and find out what she thought of ‘Infinity War’.